This free, printable CV A4 template provides detailed sections for elaborating on work history dates, titles and job descriptions in a relevant field. 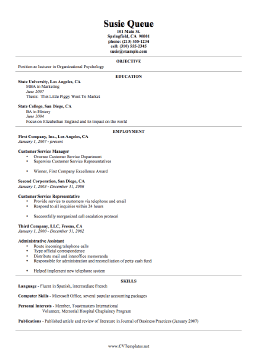 This CV Template is available free for download. Available in Microsoft Word (.DOC) format, just download it, open it in Microsoft Word (or another program that can display the DOC file format,) and print. If you don't see a CV design or category that you want, please take a moment to let us know what you are looking for.